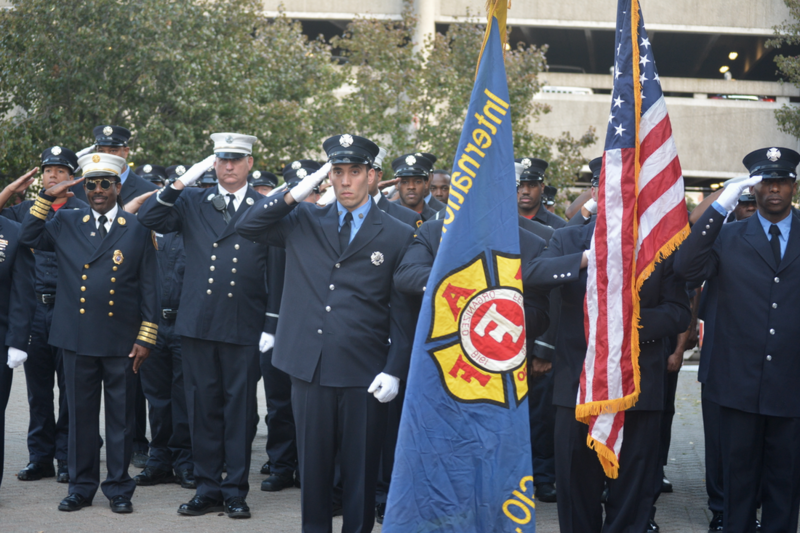 A crowd of elected officials, city officials, police, firefighters, emergency service personnel and members of the community gathered on the Mount Vernon City Hall Plaza to honor the victims of 9/11 on the 16th anniversary of that infamous day. Opening comments came from Deputy Chief Roy Hastings who acted as the Master of Ceremonies. For many years, Chief Hastings played taps with his horn at the annual ceremony prompting many tears to be shed by the participants. 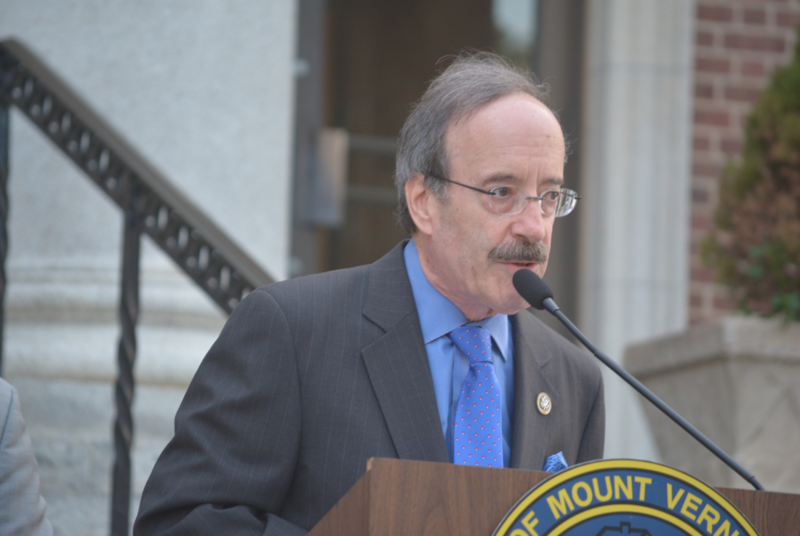 When introduced, Mayor Richard Thomas gracefully had Congressman Eliot Engel speak before him since he had to immediately depart due to other engagements. “I love representing Mount Vernon because of what is happening here right now. Mount Vernon is a community that cares deeply about many things, especially 9/11 when five Mount Vernonites perished. 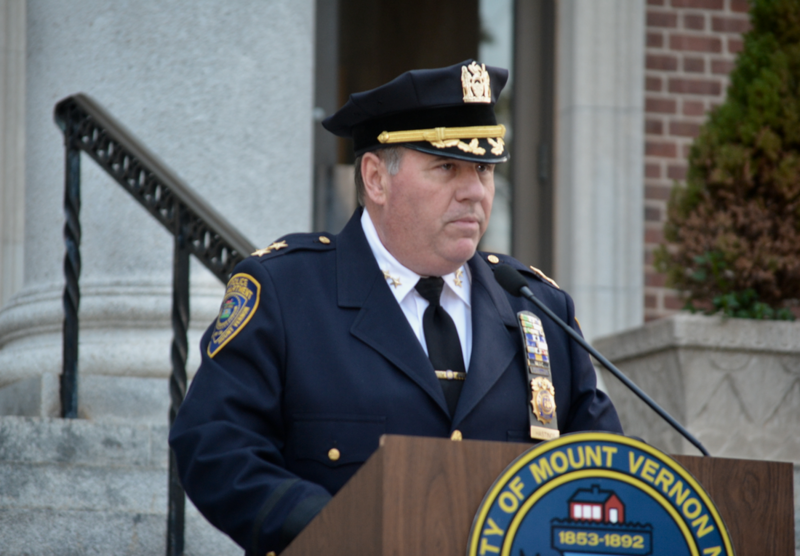 It is truly an honor to represent this city for over 20 years,” said Engel. 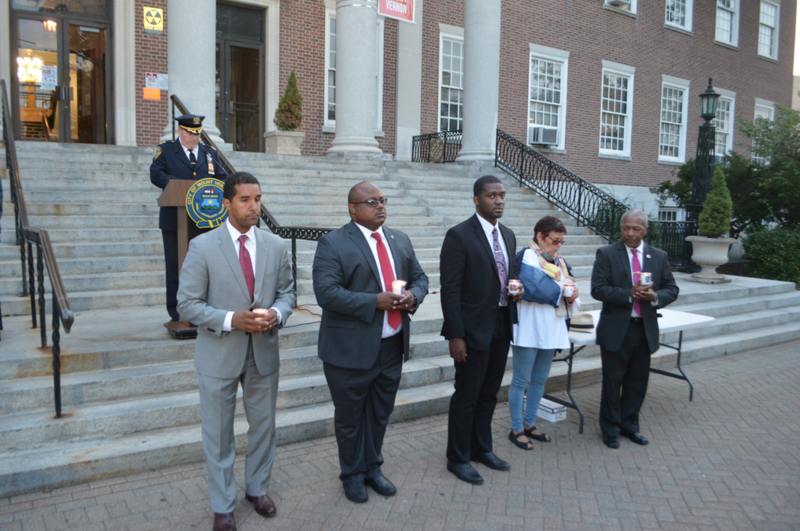 Other speakers included NY State Assemblyman Gary Pretlow and City Council President Roberta Apuzzo. When Mayor Thomas approached the podium to speak, he had a solemn look on his face. “It is an honor to be in the presence of so many first responders knowing that some of you participated in the rescue effort on that terrible day of destruction at the World Trade Center,” said Mayor Thomas. 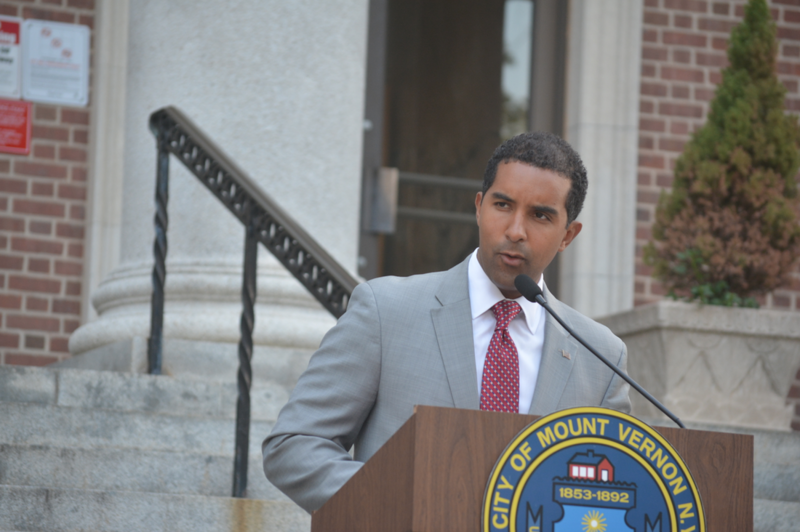 Prior to ending his speech, the mayor read the names of the five individuals that Mount Vernon lost on 9/11. They included: Michael A. Boccardi, Jonathan E. Briley, Sandra P. Campell, Katie M. McCloskey and Rochelle Snell. Cornelia Brown provided excellent vocal musical selections throughout the ceremony and sang the national anthem. The highlight of the ceremony took place when Rev. Alfred Gordon, a Marine Corps veteran, read a unique and moving poem in memory of those that perished on 9/11. He received a thunderous applause from the audience. Rev. Gordon also provided the invocation and the benediction. Near the end of the ceremony, taps was played and members of Mount Vernon’s Finest fired a volley of bullets from their rifles. 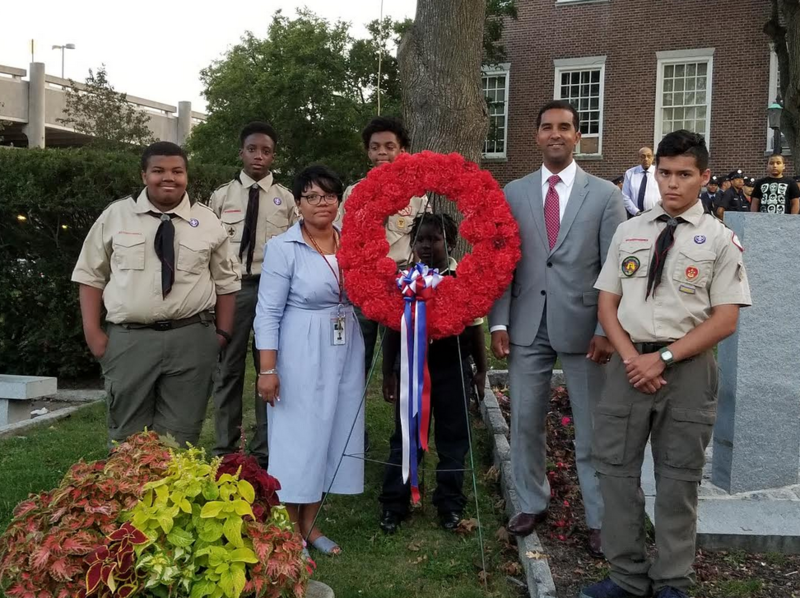 Next, accompanied by a group of Mount Vernon Boys Scouts, Mayor Thomas laid a red wreath by the Twin Towers monument. Prior to the benediction being provided by Rev. Gordon, five candles were lit in remembrance of the five Mount Vernon heroes that died on 9/11.